I recently had the opportunity to work on a music video commissioned by the amazing electronic artist, Savant. Amanda Cha led Shaun Ellis and myself to make an arcade-style sidescroller that follows our hero - Mom - on a smashing journey. The song is called Sledgehammer, and yes, there is a sledgehammer. We needed to work quickly in order to complete the video within a single month. The first few days were spent discussing the story arc, character designs, storyboards, timing, and technical limitations (self-imposed or otherwise). To prevent the game from being too modern-looking, we created a universal color palette and settled on a pixel size (one fourth the full video size, at 72dpi). The resulting style guide proved essential, especially since we all live far from each other and couldn't always communicate due to different time zones. As a proof of concept, we made test animations and stand-ins for the video itself, so Amanda could start putting everything together while we refined the assets. 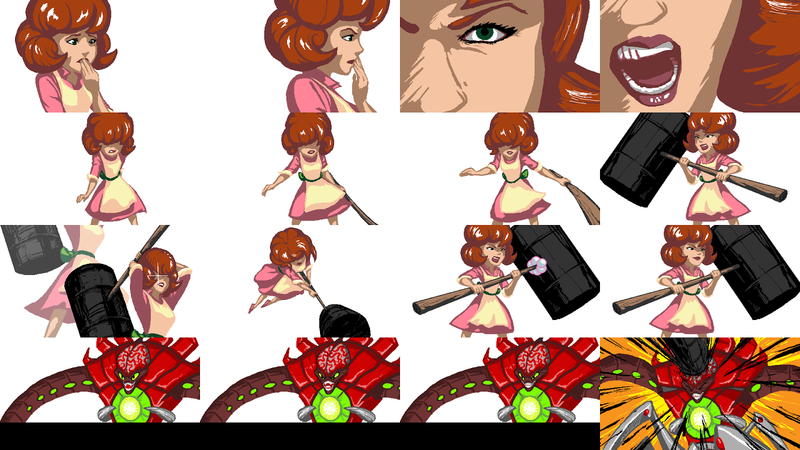 And here's my full sprite sheet for Mom, including the laser power-up (a pearl necklace). Note: these belong to myself and Savant's label and are, under all circumstances, NOT for use by anyone else. We planned to include many more animations - most notably some attack moves while she was flying on her rocket boots - but that scope was too high and we were forced to reduce the amount of animations to the essentials. We only had one month to make the video, from concept to completion (the production phase took 2 weeks). Even though we were crunched on time, it came together nicely. Here's the final product. Enjoy! Amanda and I sporadically work on a fake Pokedex as an homage to Pokemon. Some of our designs originate from old ideas we had long ago, while others are new. There are two Fakemon I'd like to showcase who went on a journey from a terrible design to a good one. To prevent scalding your eyes with cruddy webcam pictures, I loosely sketched over the older sketches - but did not change the quality of the drawings themselves. Every Pokemon game needs a basic animal you can catch at the beginning to ease you into the game. 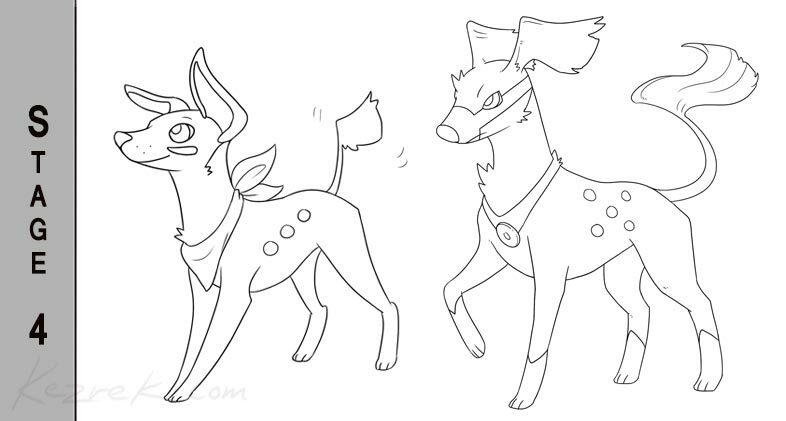 Normal types are traditionally simplistic in nature and design, so I tried my hand at making a dog Fakemon. These were made years and years ago, but after rummaging through my old crap and seeing these guys again, I wanted to readdress them. As you can see, there was a lot to fix. 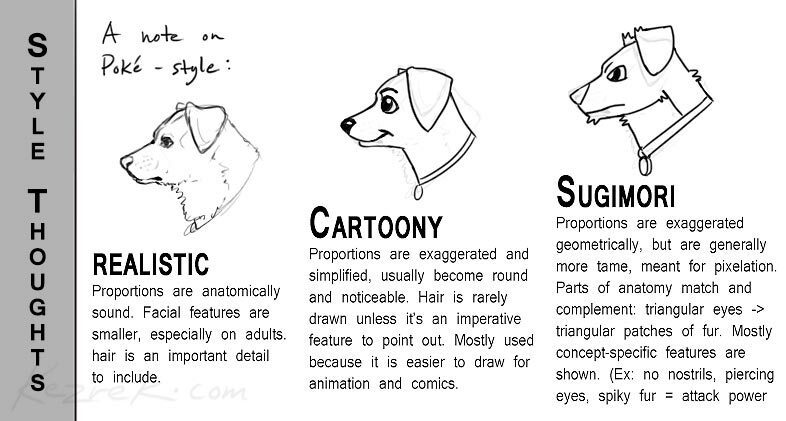 The written number 2 and 21 don't make any sense to naturally occur, and they just look like any old dog sans Pokemon's Sugimori style. However, there were features I wanted to keep in mind. The muzzle, and some indicator that this is a racing dog. 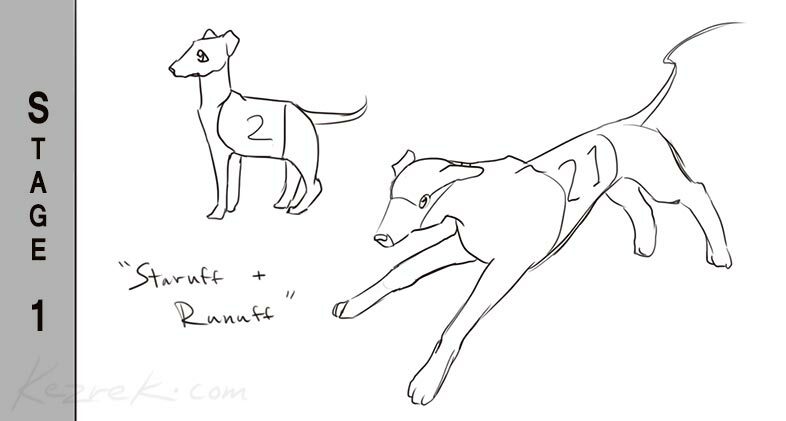 These early doodles attempted to accomplish such a motif with the race numbers on each dog's side, but that needed to change. The name change was a no-brainer. Staruff and Runuff sound stupid. 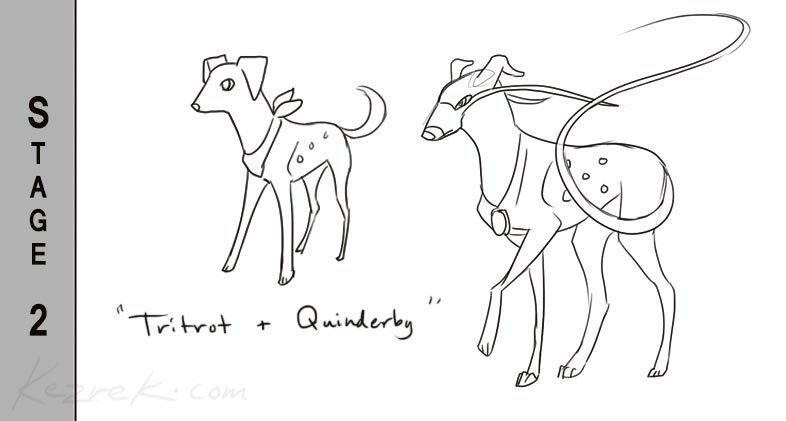 Tritrot sounds playful, and Quinderby sounds not only more developed but more competitive. With these sketches, not much has changed stylistically yet. 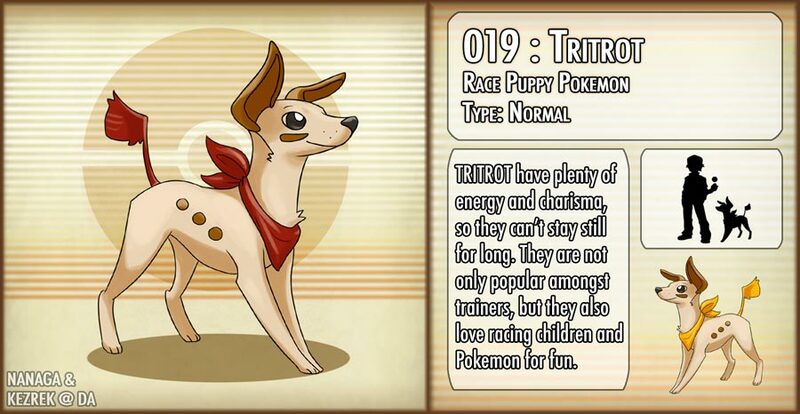 But design wise, Tritrot gained a little bandana and three dice-oriented dots on his side rather than a number 2. 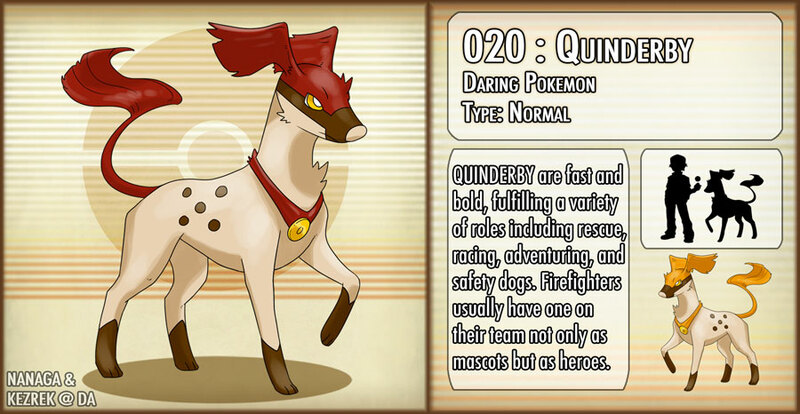 Quinderby has longer, thinner legs, an extended muzzle feature, five dice-oriented dots, and a medal. These two were meant to embody playfulness, loyalty, and athleticism. They didn't embody zilch yet, still looking like dogs with stuff on them. 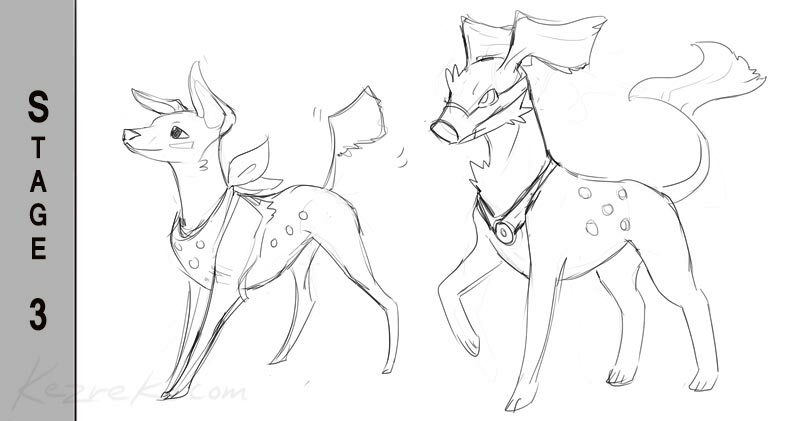 There was a severe lack of 'Pokemon' look to them that was carefully assessed as I drew the final design. Not only are the poses profoundly better, but I finally kicked into my senses and took proportion and Pokemon design style into consideration. Tritrot was made before Quinderby, and even between these two under-sketches, I think I made progress with the Sugimori mindset. Both needed bigger heads and anatomical style choices. A big thanks to Amanda for suggesting the flag motif, and helping to change Tritrot's ear design. I added a little marking to Tritrot's cheek resembling the eye black used in sports to push his athletic energy. For Quinderby I made sure to cross his eye with the muzzle marking, and meshed it with his nose as well. Pokemon tend to do this; parts of them sometimes match up with one another for the sake of their pixel art. It's easier to indicate structural features when there is less information to cram into a small pixel space. After much deliberation, Amanda spontaneously asked 'What if the ears were flags too?' So they changed, and looked 10x better instantly. Even between the under-sketches and their final line art, fixes were made. 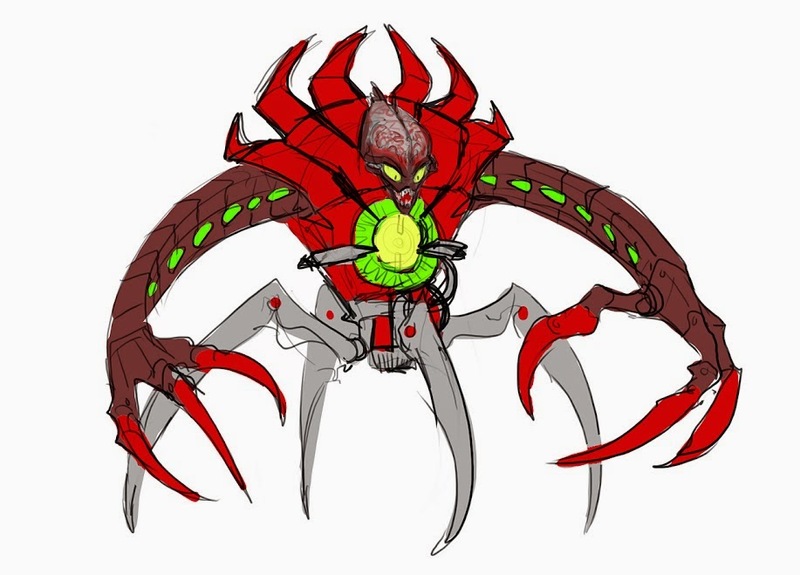 Amanda helped with Tritrot's eye design, and his head also grew in size. Quinderby got some boot-marks and a couple more tufts. The line art itself is made with the basic 3 to 4 point Photoshop brush with 70% hardness and 25% spacing, with size-to-pen-pressure on, but no opacity pressure. After it was finished, I duplicated the layer 2 or 3 times to strengthen the lines and make it easier to color them in. After all this, I've learned much about style-matching. Here's a little guide for you. It's rudimentary but it's what I learned. It seems the best thing to keep in mind is that Pokemon are - first and foremost - made for the games. Imagine scaling down your Fakemon designs and having to pixelate them. Will they hold true to their more specific, drawn-out designs? Will a gamer be able to emulate your drawing if they only saw the pixel sprite? Obviously, since the newer games have higher resolution, more details are permitted (one possible reason why their designs are getting more complex with each generation). 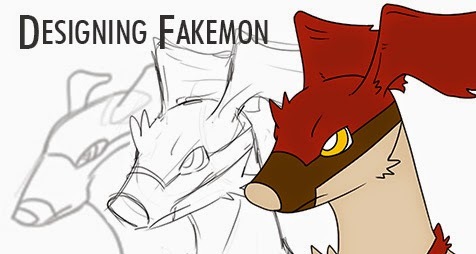 If you'd like to see more Fakemon, visit our Pokedex.